NEW Orbital High Speed Balewrapper. The McHale Orbital Bale Wrapper is a high speed round bale wrapper. The McHale Orbital harnesses the proven vertical wrapping ring technology used in the McHale Fusion to deliver a high output, low maintenance bale wrapper which is capable of keeping up with multiple balers. Do you need a high output square bale wrapper that can wrap 80-100 bales an hour? The McHale 998 single square bale wrapper is a feature packed single bale wrapping machine that has a conveyor that loads square bales from the field and loads them for wrapping. The McHale 998 square bale wrapper will wrap bales up to 5.9ft in length and can wrap double stacked bales. 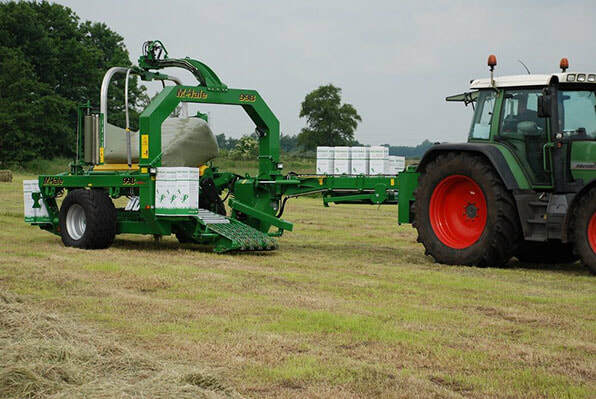 This self-loading machine will wrap and load at the same time, saving everyone time-which when it comes to baling and wrapping hay means it will save you money. You can rest assured that you are getting a great product when you get the McHale 998 square bale wrapper. McHale’s research and development is conducted in house and goes through a rigorous testing process before releasing it on the market. McHale is known around the world as a manufacturer of high output, sturdy and of the most advanced technology in the market. While the 998 square bale wrapper is the most advanced in technology, it is also simple to operate through the tractor cab with the expert control console. Advanced technology means easier to use- that’s the wave of the future. With one button you can operate this unit to load the bales and wrap them. 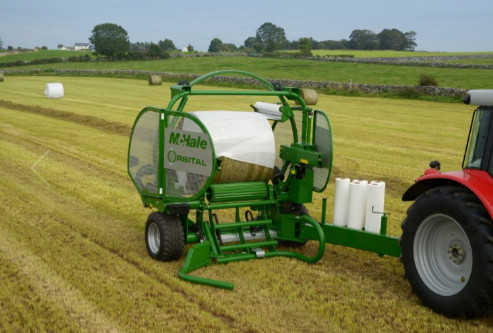 So whether you are a horse operation or prefer square bales, or need to wrap square bales singly or double stacked, take a look at the McHale 998, because it is as high output as they come! The McHale 998 square bale wrapper can set you ahead of the crowd and save you money year after year. 991 High Speed Round Balewrapper. For the medium to high producer, there is a single round bale wrapper that stands out among the pack, the McHale 991 wrapper series. These are trailed units that come in either cable controlled with 4 levers (991 BC) or with fully electronic in tractor settings (991 BE). The McHale 991 single bale wrappers are self-loading, and have a high output rating for producers who need to wrap bales fast and efficiently. The McHale 991 single round bale wrapper has several patented features that are unique to McHale. The first is the multiple control options. If you get the 991BE you are getting a fully electronic machine with a computer screen in the cab, if you go for the 991BC, you get the 4 lever cable control feature that is also easy to use. The McHale 991 series has a patented ground supported bale damper system that softly places the finished, wrapped bale back on the ground and if you wish to place it vertical there is a side tip option that is switched with the placement of a pin, for easy side tipping. The McHale 991 has a heavy duty chassis and lift arm for loading the bales onto. This has been tested over the past 15 years by McHale. Many McHale customers have wrapped 150,000 bales and customers have been happy with the way this heavy-duty bale wrapper has stood up to the task. (www.mchale.net). Dispensers: The two 750mm aluminum dispensers maintain a consistent stretch, which maximizes film usage. The dispenser units consist of two aluminum rollers, which are geared to each other with robust steel gears of different ratios. The two dispensers on the 991 High Speed are stepped so that there is an overlap where the two sheets of plastic come together. Cut & Tie System: The McHale hydraulically operated cut and tie system cuts and holds the film in position ready to wrap the next bale. This time saving device eliminates the need to manually reattach the film. The operator can manually adjust the dispenser post height to its maximum position using the height adjustment handle. When in this position the roll of plastic can be put on the dispenser closest to the tractor, with this dispenser position the plastic will be applied to the center of the bale to ensure the correct overlap. The operator can then select the “X1” button on the control console and allow the machine to operate as a single dispenser machine. Read other great options like Control Console, Automatic Film Break Sensors and Damper System.